Fly from Rio to Chicago. Is one hour layover in Sao Paulo ok? Fly from Rio to Chicago. One hour connection in Sao Paulo: ok or ugh?! 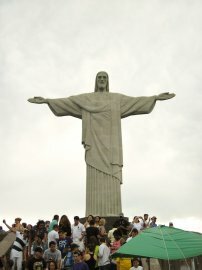 I was in Rio de Janeiro for business this last week. I have been dreading the Rio to Chicago return flight: I fly back to Chicago through Sao Paulo with only a one hour connection time. I didn’t pay attention when I booked my trip, but when I was in Rio, I called United Airlines twice to discuss my options. One hour is really too short. The first call, the United person offered to rebook me on some flights that would get me to Chicago 4 to 8 hours later at a cost of ~$300. She acknowledged my concern about how short the connection time was but said it was within company policy. I didn’t do anything. Well as it turns out, I was easily able to make my connection, but for other Rio to US travelers that connect through Sao Paulo, there are some things you need to know. In Rio, you go through immigration and customs even though the 500 mile flight is a short domestic flight, it is treated as if it were international. We got to the United counter when they opened at 4pm, but didn’t get to our gate until 5:30. The lines were very long. Be sure to get to Rio early. When you land in Sao Paulo, you park at a gate in the international transit area. I walked two gates over to get to my connecting gate. I didn’t need to go through security, no additional passport control. This worked out ok. I was going to Chicago, but the one hour lay-over was also for people going to Dulles, Newark, and Houston. So yes, you can do a one hour layover in Sao Paulo, but be sure to get to Rio very early. You’ll need the extra time. For reference: UA860 Rio->Sao Paulo 6:45 to 8:10pm. UA844 Sao Paulo->Chicago 9:10pm – 5am.